Historic Wines of the Cape (Pty.) Limited (HWC) was established in 2000, as a Wine Warehousing and Distribution Services Company, at the initiative of Hein Koegelenberg, CEO of La Motte Wine Estate and Leopard’s Leap Family Vineyards, and his father-in-law, industrialist (the late) Dr. Anton Rupert. The objective was to establish an undertaking that would operate mainly as (a) a services company and (b) a distribution company. It was to become the premier distribution agent for noble South African wines, internationally and locally, providing a professional, cost-effective service to the three historic Rupert wine farms in the Franschhoek Valley, namely La Motte Estate, L’Ormarins and Fredericksburg (today Rupert & Rothschild Vignerons) . Symbolic of the historic association, the foundation-dated gables of these farms — Fredericksburg (1690), L’Ormarins (1694) and La Motte (1695)— are featured in the HWC logo. Services were to be focused primarily on Rupert-owned farms, though several other high-profile Cape wine farms were accommodated during the initial stage. Today, as a result of the significant growth in the Rupert brands and the more extensive demands, HWC provides services exclusively to La Motte Wine Estate, Rupert & Rothschild Vignerons, Leopard’s Leap Family Vineyards and, more recently, to international wine merchants Perfect China, a shareholding partner in Perfect Wines of South Africa formed in 2011. Following this venture, Perfect China purchased the wine cellar at Val de Vie Estate, Paarl, which transaction gave birth to the L’Huguenot wine brand, today included in HWC’s operations. The core of the HWC operation is its warehouse in Montague Gardens near Cape Town. Initially the premises occupied 2 000 square metres, enlarged by a further 3 000 in 2001 and, in 2016, a further 3 000, totalling 8 000 square metres, all under cover. 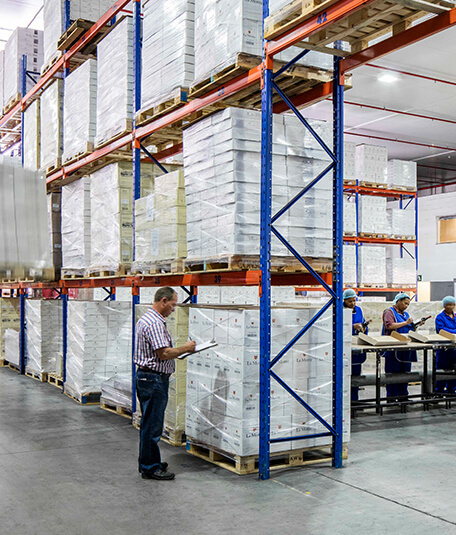 The entire warehouse is air-cooled and provides the most modern facilities regarding storage, bottle maturation, labelling, container loading and dispatching, and facilitates the consolidation of shipments for major international wine merchants. The warehouse has a capacity of approximately 700 000 cartons (6 x 750 ml) and labelling facilities for 4 000 cartons per day. A major advantage is its closeness to Cape Town’s container harbour. Approximately 50 job opportunities are provided at the Montague Gardens premises. Administration facilities, available exclusively to La Motte Wine Estate, Leopard’s Leap Family Vineyards and L’Huguenot Vineyards, are based in Franschhoek. For enquiries and further details: Cecil van der Merwe, Distribution Centre Manager. Rainbow Park, Racecourse Road, Montague Gardens 7441.